We recently had some neighbors over and i wished to serve some snacks on a platter , vibrant and fresh just like our new friends. The all easy hummus with crudités did a brilliant job with loads of compliments and accolades for a full evening. The recipe is true fusion of cultures- French crudités meeting the Middle eastern hummus. 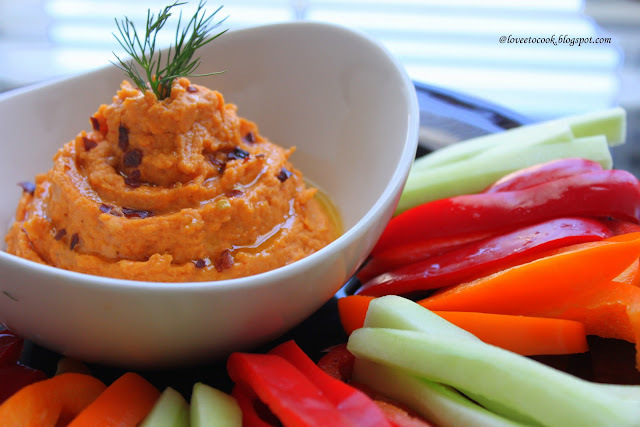 Crudités are basically appetizers consisting of whole or sliced raw vegetables usually dipped in a vinaigrette or sauce.And the all favorite hummus which is believed to have originated in ancient Egypt, is a spread made from chickpeas. Actually hummus in Arabic literally means chickpeas itself. 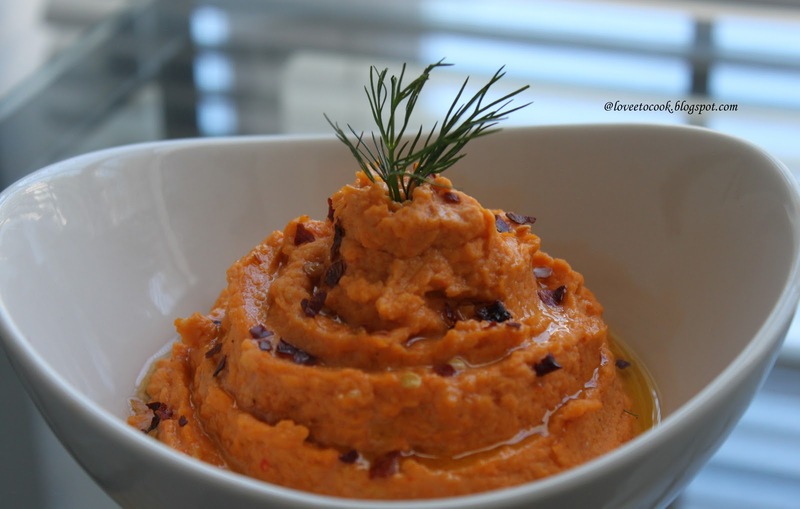 The basic hummus recipe is very versatile as you can add anything to it and a totally new flavor dimension is on the horizon every time. Ideas for flavored hummus can be as wide as your taste palette. To suggest a few flavors -- try making roasted garlic hummus , greek hummus with olives, roasted eggplant hummus, sun dried tomato hummus, lemon garlic hummus,lemon cilantro hummus, jalapeno hummus... i mean the variety is infinite here :) You can even try black bean or white bean hummus where you replace chickpeas with black beans and cannellini beans respectively. Today being the roasted red bell pepper hummus day, lets - get set and go ..
cherry tomatoes, celery, broccolli and the like. 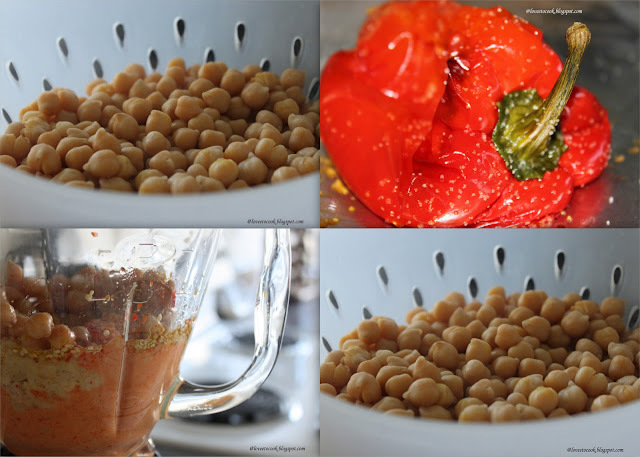 Lets start by making the hummus--- bold sweet delicious. Place all the ingredients for red bell pepper hummus in your food processor or mixer and pulse to a fine paste. Now lay the Hummus on to your serving bowl and garnish with a drizzle of olive oil, red pepper flakes , sesame seeds and dill. 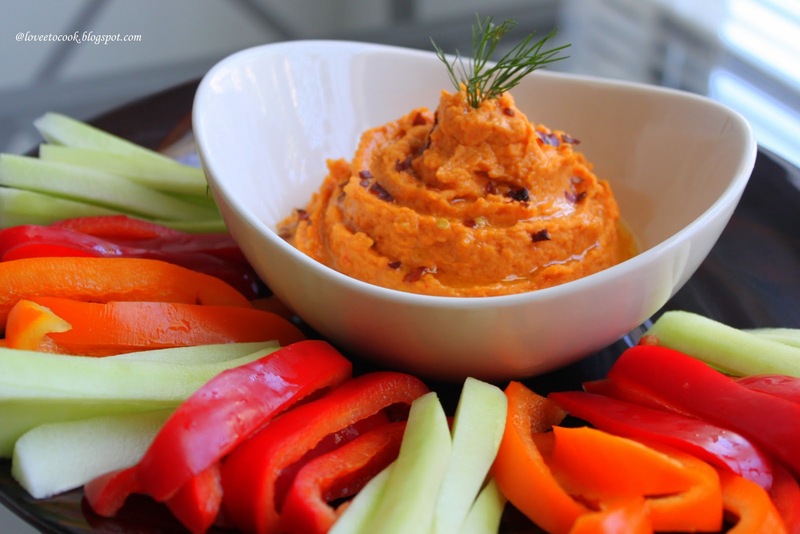 Slice all your favorite veges and serve with the delectable hummus on a platter. Such a droolworthy and flavourful hummus, i dont bother to finish that whole bowl rite now.. This is so easy and looks yum! A must-try recipe for me. Lovely color bcoz of the peppers..nice n simple one..
your pics are to die for... really great... i want to have a bite of the hummus now!